Your resume is the most important part of your audition package. 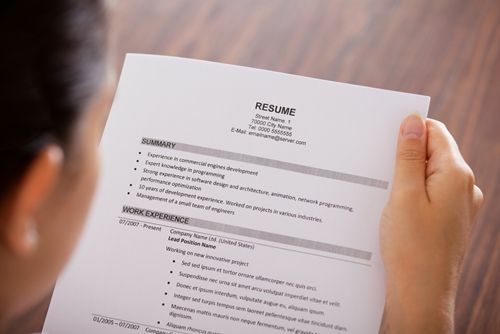 A neat and organized resume will help you stand out. Many dancers clutter their resumes with too much information. Your resume needs to be focused and tailored to the specific job you are applying or auditioning for. Dance companies get hundreds of resumes and are overwhelmed with prospective dancers. Give yourself the best chance you can by having a professional looking resume. This is specific to audition resumes. If applying for a teaching or other job, this is unnecessary. Round height to the nearest full inch. Include the names of ballets or shows and the choreographers. If you have been in many shows, only include featured roles. If you have little experience, include all you have. This includes all dance training you have had. List education, start with the most recent and work backwards in time. The more professional experience you have the less important the section on education becomes. If you are young and have little performance experience make sure to include all your training. If you received a scholarship, be sure to include that as well. Include small workshops or brief training in different styles only if it applies to the position or company you are applying for. In this section, include all honors you have received, high placements at competitions, special individual awards, etc. If you have lots to list, choose according to the relevance of the job or company you are applying for. Be sure to include this information if you are auditioning for a part in a musical. Some groups such as professional dance teams will want your modeling experience listed. Some groups such as modern dance companies that use improvisation like this sort of experience. Ballet companies may not be interested in this information. Include this information only if you have extensive training and you have space to fill on your page. It is best to include references on a separate page or in your cover letter. Only include them on your resume if the reference has a direct connection to the director you hope to work with. The word resume: that is a given. Do not include anything negative. This is your place to highlight all the good things about yourself and your dancing. Don’t mention your reason for leaving previous companies if it is negative. This information might be asked of you in an application but is not something you should include on your resume. If you are asked this, you can simply say you wanted to go in a different direction or try something new. A resume is not the place to start salary negotiation. This can limit you chances of getting a job. Once a director has offered you a contract, you can start talking about salary. You will want to talk to the general manager about this. Best of the Best: What Can You Do for the Company? You have done your research on the company that you want to work with. Now, you need to tailor your resume to show how you fit the needs of this company. You want to find common connections with the target director and your training or performance experience. Show the relevant information that relates to a specific job and how you would be an asset if hired. State what you can do for the company. You can include in your resume the position that you are looking for. If you would be willing to take an apprentice or swing position, state that as well. If you have seen the artistic directors choreographic works before you can mention that in your cover letter. Identify the companies or positions you want. Do your research on these to qualify if they would be a good fit and know what they are looking for. Create a list of your experience to draw from while writing your resume. It can be helpful to write down everything because you will want to highlight different experiences according to the company or position you are applying for. All the companies you have worked for. All your dance education: studios, schools, workshops, training programs etc. Stage and film acting experience. Anyone you have worked with that knows your target director. All awards and scholarships received. Where applicable: look at the repertoire of the companies you are applying with and note any works that you have performed. If your goal is to be a professional performer, you will need to go on lots of auditions, get your resume turned in to lots of companies and get your name out there. By attending classes, you will grow as a dancer as well as network. Many choreographers teach as well. If you want to work with a specific choreographer, try to take a class with them. Many dance companies have schools as well, take classes there! If money is an issue, look into work study. Some studios offer scholarships or work study opportunities. If you are working with a company to take classes, you not only get classes and networking, but you will also learn about the behind the scenes work. Work with renowned choreographers or instructors. Identify similarities with schools and choreographers the company or director has worked with. Use this information to establish a connection which will make you more memorable. There are many ways to organize your resume. The most important thing is to tailor each particular resume to the job you are applying for. Think about the position you want: choreographer, teacher, performer, etc. You resume should start with the most relevant information. If applying for a teaching position, highlight your teaching and leadership experience as well as your dance education. Also note that you need only include information about weight, height and age if you are applying for some type of performance job. You can also think about details such as the type of font, the size of the text and the color of the paper. Choose the method that best reflects your background and the interest of a potential employer. A functional resume would be good from a dancer with little performance experience that highlights skills rather than work history. This method lists your work history in order. It is widely used, easy to organize and easy to read. This will show a strong work history in an organized way. Usually the order of the list starts with your most recent work at the top and then works down the page with previous work. Use this method to highlight dates you have worked and choreographers and companies you have worked with. If you have little work background, are young, started dancing late or don’t have a strong background of performance, the functional method will work best. This way you can highlight your skills and not your lack of experience. Where you have danced is more important than the dates. For this reason, you can put the dates on the end of a line on the right side of the page or omit them entirely, by using the functional method. The main difference between the functional method and the chronological one is that with the functional resume the work history section is not included. This can work well for young dancers who have just graduated. However, this method can be used by anyone. It all depends on what you are trying to achieve. This method will give you complete control over how you present yourself. You can highlight relevant experience or skills at the top. The disadvantage of using this method is that it can create suspicion about lack of information. When using the functional method, it is effective to write in the third person. You can combine the two methods to create your desired result. You can highlight when and where you have worked without strict guidelines or the need to simply list your work history in order. This can be a great way to organize your resume. It will be helpful for your future resume writing and updating to keep a running chronological listing of your training and experiences. This is something you can draw from when you need to update a resume or write one that is very different from others you have done.